Two years after Metal Gear Solid: Rising's unveil at E3, the series' English actors have yet to be approached by Konami. "There's been no information and I don't know what's going on," Raiden's voice actor Quinton Flynn said in a recent interview with The Gaming Liberty. "I've tried to make efforts to find out what's happening and have not been able to get any answers at all." 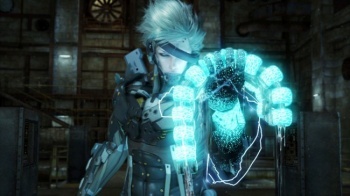 Fans of the series, including Flynn, assumed he would reprise the role of Raiden since he was listed on the game's IMDB page. However, Flynn said Raiden's dialogue for the game was supposed to be recorded last year, and he has yet to receive a phone call from the Rising team. "If they are going on and doing it without me, I can't understand why," Flynn said. "Of course Hideo Kojima is not involved in Rising in the same way he was with the other games but I just don't know what's going on. I don't know whose [sic] producing or what's happening." Flynn said he called Solid Snake voice actor David Hayter, who told Flynn he is clueless on not only Flynn's role in the MGS spin-off but also his own. Unlike Flynn, however, Hayter's name was never listed on the game's IMDB page. With rumors of a delayed 2012 release and E3 around the corner, Rising's team has some explaining to do and E3 seems like the right time and place for it. "Maybe they've been working on lots of other stuff for this game and now they're ready for me. But I don't have high hopes, let's just put it that way," Flynn said. It's hard to imagine an MGS game without the voices of Hayter and Flynn, which begs the question: is the game currently in development hell? It's also possible that Konami acquired new voice actors to further distance this spin-off from the rest of the MGS series - something the developer claimed to be a goal, in the past. It's also been suggested by fans that Solid Snake won't make an appearance at all and the Raiden featured in the game is a different one from past games, thus using Flynn would only confuse players. In any case, Flynn is saddened by his possible disappearance from the series. "I'll be hurt. I'll be disappointed and I'll be angry as well," Flynn said. In addition to voicing characters in popular series (including Sonic the Hedgehog, Final Fantasy and Kingdom Hearts), Flynn has given his voice to Raiden in the Metal Gear Solid series since the character's introduction in Metal Gear Solid 2: Sons of Liberty (2001).